The collapse of Solyndra, noted below, is the pathetic environmental story of the week, if you leave aside the story out a few days ago that global warming will make mental illness worse (hey!, maybe that explains Al Gore?). 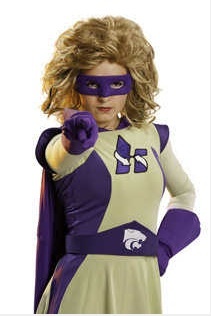 The ridiculous environmental story of the week concerns “EcoKat,” the enviro-mascot that someone at Kansas State University thought was a good idea. (Maybe it’s just a Halloween costume stunt. If so, I’ll fall for it.) I never thought things could get any more ridiculous than Captain Planet. I still have my Captain Planet lunchbox and thermos, which make for great props when explaining Hollywood’s endless superficiality about all things green. But at least Captain Planet was a cartoon–a little kids’ show, unlike EcoKat, which was meant for college students. Actually, come to think of it . . .